We are very proud to introduce an important new feature for investors: Expected APR. With this new feature, you will be able to have a better estimate of how much you will earn with your investment. In the browse listings page, you can now filter by the expected APR, and on the specific listing page you can view the effective APR and estimated loss. 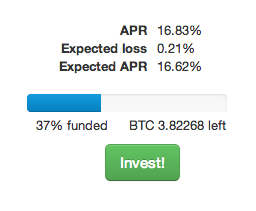 APR (Annual Percentage Rate) tells you how much your bitcoin will grow at an annualized rate when invested in a loan. For a 1 month loan, imagine re-investing the Bitcoin you got back in another loan with the exact same terms 12x over the period of 1 year. It is a standardized computation that provides the bottom-line number that reflects how much an Investor can gain. BTCJam calculates the probability of loss determined by historical repayment rates, the borrowers information, and repayment behavior on BTCJam. This calculation is the expected gain determined by the APR minus the Expected Loss. This is the estimate of how much you will gain. And you invested the Bitcoin equivalent of $10. The APR is 8.20% so you could grow your bitcoins to the equivalent of $10.82 with an Expected Loss of $0.01. If you invest a total amount of $10,000 with each invesement at $10 in 1000 of loans with those exact numbers, it is expected that 1 defaults (1000×0.11 ≈ 1), so you lose 1 and 999 loans grow with 8.2% a year. 999x10x1.082 = $10,809.18. Now, your effective return is ($10,809.18-$10,000)/$10,000 = 8.09% which matches your expected APR. Be aware that the expected APR is based on the historical performance of BTCJam’s repayment rates and that your actual performance may vary. Remember, having a diversified portfolio significantly lowers the risk of your investments! Learn more about diversifying here. Excited? Check our newest listings! ← Announcing BTCJam’s Referral Program!